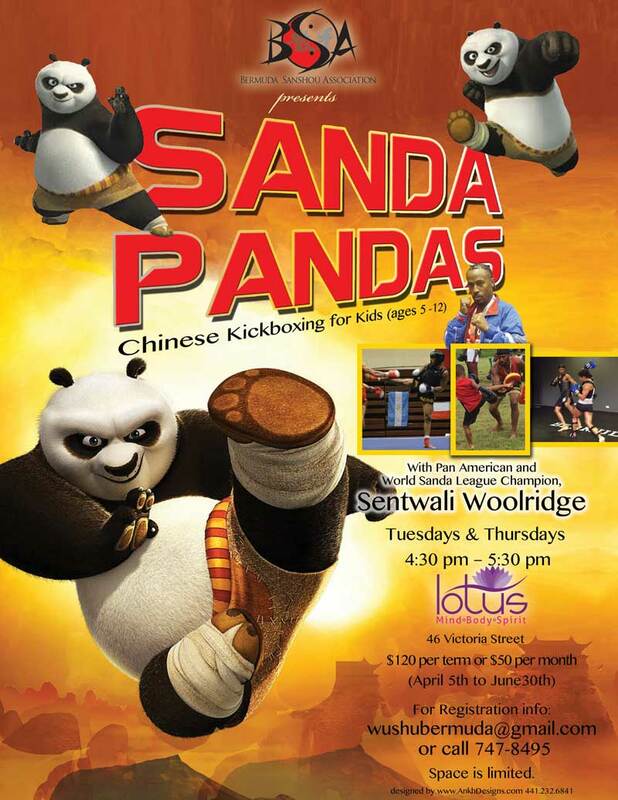 The Bermuda Sanshou Association [BSA] is set to commence “Sanda Pandas,” a Chinese Kickboxing program for children aged 5-12 on April 5 at Lotus. A spokesperson said, “The BSA was formed in October 2005 after it was announced by the International Olympic Committee president that wushu, the national sport of China, would be a part of the 2008 Beijing Olympics. “San shou/ san da is the full contact fighting element of the sport of wushu and consists of punches, kicks and throws/takedowns. Wushu is also made up of taolu [forms] and takes on the more artistic side of the sport. “BSA has competed in every biennial World Wushu Championships since 2007 securing a bronze medal in 2011 in Turkey and a silver medal in 2013 in Malaysia. BSA also competes in the biennial Pan American Wushu Championships and currently boasts gold medalists in the 3 weight classes. “The class will be taught by current Pan American Wushu Champion and World Sanda Cup silver medalist Sentwali Woolridge. Sentwali has been a member of BSA since 2006 and has won a number of international titles to solidify him as one of the top martial arts competitors in Bermuda’s history. The Bermuda Government Achievement Award Winner and BSA Team Captain possesses a wealth of knowledge and skill and is an excellent instructor who strikes a balance between discipline and fun in his classes. If you are interested in registering for the class, email wushubermuda@gmail.com to receive an application.